There have been 24 species of butterflies recorded in Narroways/Ashley Vale in the past 20 or 30 years. This is a an impressive count for an urban site and considering there are only 70 resident and migrant butterfly species in the UK, some of which are very rare. We have records going back 30 years but more systematic records of local butterflies extend back to 2002. 18 species of butterflies can be regarded as common in that they are recorded most years. These are Comma, Peacock, Red Admiral, Small Tortoiseshell, Brimstone, Large White, Orange Tip, Small White, Gatekeeper, Marbled White, Meadow Brown, Ringlet, Speckled Wood, Common Blue, Holly Blue, Large Skipper and Small Skipper. The Green-Veined White, although under-recorded because of confusion with the other white butterfly species, is also likely present most years. This leaves 6 species that can be regarded as Narroways/Ashley Vale’s rarer species- two migrants- Painted Lady and Clouded Yellow and 4 resident- Small Heath, Brown Argus, Small Copper and Essex Skipper. This butterfly is an immigrant from North Africa, absent locally most years but occasionally occurs in large numbers. Dozens were seen flying quickly northwards on a calm sunny day in May 2009. Other years one or two have been seen between May and October. Painted Lady butterflies tend to favour dry, open areas. This other migrant butterfly is more often seen on chalk downlands close to the south coast in late summer. There is just one local record- an individual seen by Des in Narroways Cutting on a sunny day in September 2014. Although Narroways would seem to have suitable habitat for this species the most recent records date back to the mid 1990s. Rupert Higgins described Small Heath in 1995 as being ‘fairly common in the cutting and on the hill’. They prefer dry, well-drained situations and finer grasses such as Fescues and appear to be declining. 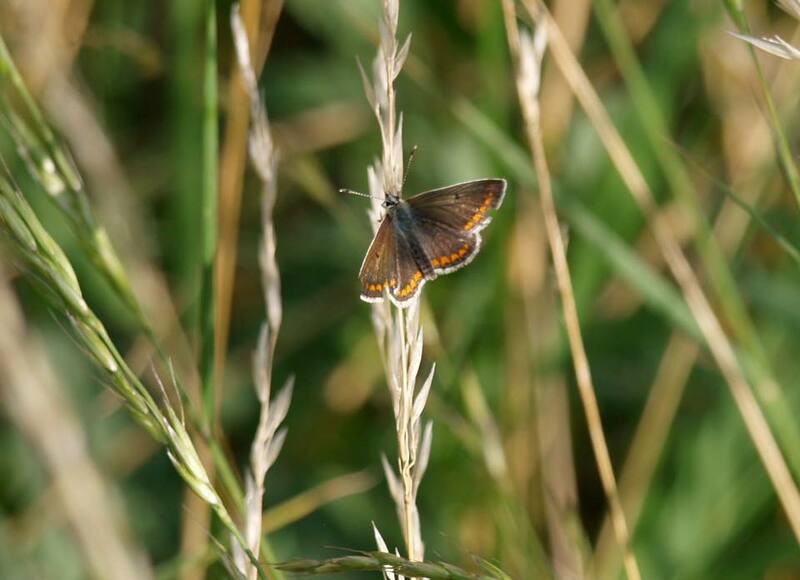 The Brown Argus is a special butterfly to see locally. There have been just two sightings, by Harry, on Bird’s Foot Trefoil in Narroways Cutting in August 2003 and on tall grass in the Church Field near the lane in 2011, also in August. They need to be studied carefully so as not to confuse them with female Common Blue butterflies. This is another attractive, locally rarely seen butterfly typical of unimproved grasslands. There have been 7 local sightings of individuals between July and October over recent years. One was seen on Ragwort in the Church Field on a warm sunny day in August 2009. They have also been seen in Narroways Cutting, near the railway line and on brambles by local footpaths. The most recent sighting was in 2017 on Ashley Hill allotments. Small Copper is associated with warm and dry unimproved grasslands. The Essex Skipper needs very close study to tell it apart from the very similar Small Skipper. It is probably under reported locally. The main identifier is that it has glossy black tips to its antennae compared to the Small Skipper’s dull brown or orange tips. The first recorded local sighting was in July 2009 when 3 were seen, and photographed, by Des in Narroways Cutting. They have also been seen in the Church Field, and on flowering lavender in Lynmouth Road allotments. All sightings were in July. This entry was posted in Environment, Sightings, Wildlife. Bookmark the permalink.